The old Xbox 360 RROD'd last year. We read it could be fixed, but we couldn't really be bothered to take the risk, so we bought a flashy new one without overheating problems. We gave the old one to my dad and told him if he could fix it he could have it (sent him the how-to). He only has a PS2 and only plays racing games, but as you might have noticed, they don't make PS2 games anymore, so there's nothing new for him to do, and goodness knows he won't buy anything for himself. I decided a few months ago that we needed a clock - I was fed up with having to ask him the time when he was playing a game, and since his phone broke (which was really just a glorified alarm clock) a while ago we haven't had much in the way of telling the time in our bedroom - not a real problem, but it's a nuisance in the morning when I have to guess the time and end up getting up when I could have slept an hour longer. So for this I used the afore mentioned broken old Xbox. It was still in perfectly good shape, it was just sick on the inside. Then there's the clock parts, and a hot glue gun, just in case I broke something and needed to fix it for aesthetic's sake. I did not picture tools because I am clever, but you will likely need them. Most games consoles have tools you can get to open them specifically, but I had none so I used little screwdrivers. You'll also want a drill of some kind. I couldn't find a power drill (disappointing but probably for the best) so I used a manual one. I also didn't know how to change the drill bits so I used a small one and then a big one. Leave me alone, I'm a girl, I'm supposed to make sandwiches not use tools. Keep in mind with different consoles, however, how the clock will look. As long as there is enough room inside the chassis to fit the clock box (usually about 3x3 inches) and have the...the bit the hands are fixed to poking comfortably through at the same time then it'll be fine - clock hands don't need to be flat against anything. The Xbox (original and 360) work great because they are just that - boxes. The sides that matter are flat - and can be stood easily on their side if you'd rather have a chunky bedside clock instead of a wall clock. Your first task is to dismantle the console. Regardless of the console, you can probably find tutorials online for taking them apart. Failing that, you only want the chassis really, so have fun banging away at the seams. I used Llamma's tutorial for taking this Xbox apart, but I'm certain you can find other console tutorials elsewhere. If you're working with an old Sega Mega Drive/Genesis (the console of my childhood, and what seems to me to be the Nokia 3310 of game consoles) then it might be a little harder to find a tutorial, but it would be that much more awesome. Congratulations of being brave enough to take the console apart. Despite the fact that it was dead I was still apprehensive about taking it apart, as some of you already know. The next step was to clean it - it's an old, "white" console so naturally it's gotten dirty over the 4 years it was in use, and eventhough it was already taken apart, I still found myself trying not to get water in the vents. Adoy. After I found some sense I managed to clean it easily with a rough cloth and warm water, then because it was an awfully warm day, I left it in the sun (a hard thing to find in England) to dry and it was done in 5 minutes. Next the drill came out. I wanted it on the middle of the top plate so I went ahead and drilled it. Because I was using a small drillbit I drilled about five holes closely packed together, then took out a much larger drillbit probably about 11mm thick and used it to round out the hole and make it smooth. Once that's done, fix the clock in place and add the nuts and arms. The best way to ensure it will tell the right time is to put both arms on so that they say 12 o'clock. Add the battery to the box and set the time. I had to remove the inside, obviously, to get the clock in and reduce weight, which would have left me with a big hole where the disc drive used to me. The eject button was easily removeable in the first place, and with a firm tug I got the cover of the disc drive off too. I used my hot glue gun (the only time I needed it, fortunately) to fix the drive cover and eject button together. The eject button still easily fixed back in place without the Xbox's guts inside, so I used that to keep the drive cover in place. The console is going to hang on the wall, faceplate facing downwards, which meant that as I tipped it that way, the drive cover started tilting out. I hot glued some card to the back of it which is keeping it inside while it's tipped that way. Snap the pieces back together - this is much easier than taking it apart, just go backwards in the same order that the tutorial told you to take it apart in. Hey presto, you have a console clock. If you're flashy you could probably easily cut a big hole in the top plate and put a digital one in instead, but I can't stand the light the digital clocks create. I'd rather put up with ticking, it's much easier to tune out. Seeg wanted numbers on it, while I preferred the plain faceplate, but since it was his Xbox he let me destroy, it was only fair. But I don't like normal numbers. I'm much more partial to Roman Numerals, like him, but they also seemed too bland. Oblivion and Skyrim are two of my favourite games, so I decided to see if there were any such Daedric or Ayleid numericals, but apparently Daedra and Elves don't know how to count. 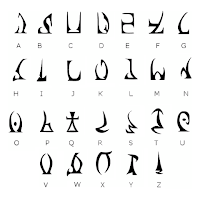 So, in that case, I sat down and doodled out some Roman Numerals in a Daedric style (Daedric alphabet shown left). I drew them onto the xbox when I was happy with them then painted them on when that was done. I'm dead pleased with how this turned out, to be honest. I don't find the numbers overpowering at all, like I thought they might be, and I'm pleased with how they turned out as well. The next task is to drill a second hole in the back and get it up on the wall. It's very light so it won't rip the wall down, and I've given this great old console a new lease of life - one that won't overheat it. My dad never tried to fix the Xbox, - like us, he couldn't be bothered. So we gave him a new Xbox 360 for Christmas 2012. And, surprisingly, he uses it. Still only racing games, but he was bowled over by the scale of the gift. It's usually just a book. What a clever use for the old xbox! It turned out great! How awesome! Our XBOX will probably die eventually since we use it all the time. I'll have to keep this in mind for when it does. Man that takes TALENT, it looks awesome! Great way to reuse something that no longer works. Wow that was a great way to repurpose the XBOX! Very creative!